I don’t know if people are really aware of this fabulous bread book. It is difficult to believe that you can have bread in minutes…let alone bread that is this good. It is so easy…flour, yeast, salt and water…mixed in a big bowl until it looks like goop. Leave it out on the counter until it rises to the top…bubbling and sticky and looking as though you are not going to get anything good out of it at all. Put in in the refrigerator and let it sit until the next day…although yesterday I mixed the starter and made the bread all in the same day and the bread was still fabulous. I even forgot to put the requisite bowl of water in the oven and the bread still had a dense yet light interior and a crusty crackly crust. I have made big loaves and small loaves and even pizza out of this same dough. It never fails and you truly do not knead it…you sort of toss on some flour and flip it around and let it rest…I call it magic…the authors call it artisanal no knead bread. 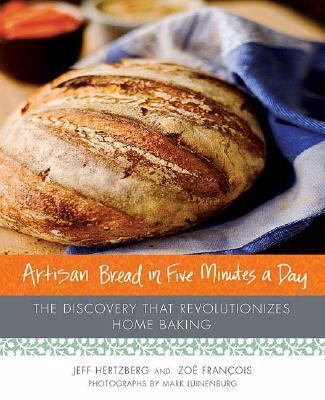 I have never in my life had success with bread making until this book. I make it weekly because it is fabulous for toast and equally good dipped in a pure organic olive oil. I use organic unbleached flour and yeast and sea salt and the result is perfection all of the time. I have made it so often now that I know the 4 ingredient recipe by heart. I can easily give you the recipe but the book has so many variations and tips that it is worth buying. Oh…the authors state that if you don’t wash the bowl that the starter is in when you start the next batch…you will have sour dough bread…I find that totally magical. I have a friend who just loves this book! I haven't tried it yet, though, because I'm afraid of yeast. Nice review! Umm…this sounds delicious. I should check this book out. I just hope I'll really use it. I have several cookbooks I bought, used a couple of times, didn't use several at all…I'd hate for Artisan Bread to sit dusty on the shelf, but bread in only 5 minutes?…there may be hope! Thanks for sharing about this one. I'm sure my hubby would love it! I love homemade bread! Fresh from the oven with lots of butter and honey. What a feast 🙂 I wonder how this bread would do at high altitude?